It used to be, when we were all quite young, that we would cut a switch from a length of birch. It was best to pick a branch that had a few leaves already on it, and then shear those off with a good serrated blade, rather than try to cut a branch that was too young and green. Those young ones would never break, just bend, bend, bend, and you could cut into them for what seemed like hours if you let it get to you. A good switch was handy to have if you were hiking and you wanted to brush back some old cobwebs on the trail that were waiting up ahead for you, or if wanted to pass some marshmallows over a flame for a bit in the evening. You see, a good switch doesn’t catch fire same as the old wood does, they just singe a bit. But mostly I know I liked the sound of a switch when I pulled it fast through the air, the hissing sound it would make like a snake held out by the tail. We would wait until the sap started to rise in the birches, and then we would take my father’s hunting knife out of its big leather sheath and go out to the birch stand. I was thinking just now about why we would wait for the sap to come up when all it would do was get all over our hands, I mean, did that make a better switch? I’m guessing we would go out about that time because in Oregon, if the sap isn’t rising, then that probably means that it is raining or snowing on you, and if that’s the case, then maybe you aren’t outside cutting switches. Some kids liked to cut down the sides of their switch to make it flat with edges like a triangle or a diamond, but me I just took the leaves off and left the switch round, kind of like a pool cue. But it was important that it be straight and slender, with a good weight to it. I’ve gone ahead and told you about cutting switches because nothing reminds so much of the smell of birch sap as the amaro known as S. Maria al Monte does. And that is about all I know for sure about it. Most of what you can read about S. Maria al Monte would seem to be inaccurate, and there isn’t too much to read anyway, or so it seems. “Santa Maria al Monte” was as best I can discern a shrine in Genoa that was inhabitated during medieval times by a Franciscan monk community. The Friars apparently developed the original recipe for this amaro. It is also possible that another religious group associated with the shrine developed the recipe prior to the arrival of the Franciscan Friars. It is somewhat difficult to tell, and it is also a bit odd that I can’t seem to locate a current Santa Maria al Monte convent or shrine within Genoa. Be that as it may, in 1892 the recipe was developed commercially by a Nicola Vignale, who is credited on the bottle’s label as the patent holder. Currently the amaro is produced by Distillery Durbino, which is primarly a grappa producer both under the Durbino name and also in partnership with other brands. 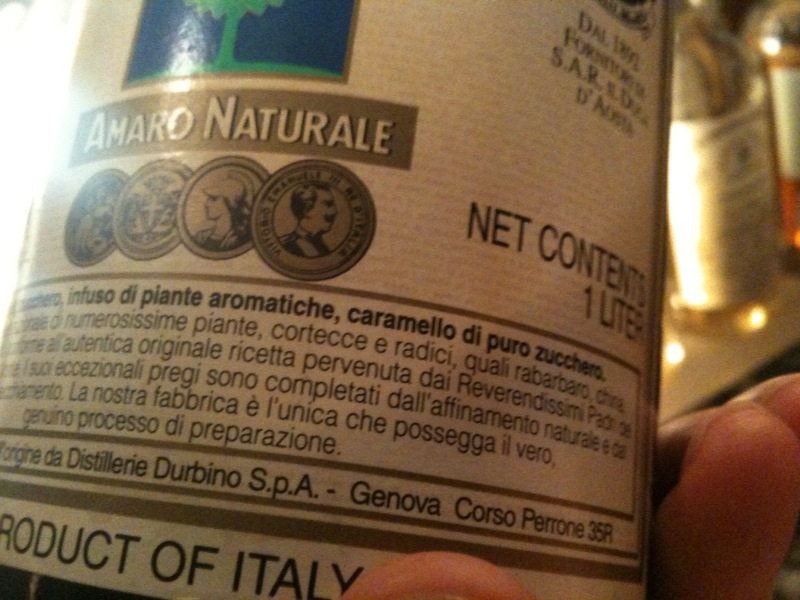 I have seen a date for the founding of Distillery Durbino put at 1992, but I don’t have any verification of that. Durbino apparently maintains 3 different facilities, two of those in Liguria, with one in Genoa (a major town inside of Liguria), and the last in Friuli. S. Maria al Monte is apparently made at the facility in Genoa. I say apparently because when you read about this amaro online, you will frequently come across mentions of an origin in the Valle d’Aosta. The bottles that I have sampled clearly indicate an origin in Genoa, however. I think the confusion stems from a prominent inscription on the label of those bottles which reads “Dal 1892 Fornitori di S.A.R. il Duca d’Aosta”. As best I can tell, The Duke of Aosta is a title of nobility given to the second son of the ruling monarch of Sardinia, similar to the Duke of York amongst the peerage of the English. There is actually still today someone who uses the title Duke of Aosta. The crucial bit to understand here, though, is that one does not have to be from the Valle d’Aosta to be a Duke of Aosta. The inscription would thus appear to be saying that this amaro has been supplied to the Dukes of Aosta since 1892. This would be akin to an English gin bearing an HRH inscription. You can see here in this picture the inscription and crest that seem to have led to many commentators postulating that this amaro has an origin in the Valle d'Aosta. I have even seen multiple references to "alpine herbs" in the recipe, although the label doesn't say anything about them. The label of S. Maria al Monte indicates that the recipe calls for an infusion of rhubarb and also orange. 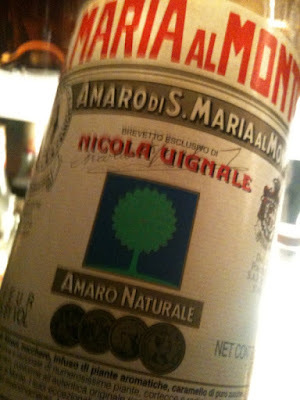 Some of the other flavors that I think of when drinking S. Maria al Monte are cola, jasmine, and ginseng. I have read that some people find menthol flavors in S. Maria al Monte, but I don’t see them nearly as present in this amaro as I do in others. When I taste S. Maria al Monte I am reminded of the waiting room of a Chinese herbalist with his ginseng tea more than I recall the cooling spearmint flavors some people say they have found. Although S. Maria al Monte has had both sugar and caramel added to it, the finish is noticeably dry in comparison to many other amari, which I appreciate. It is on the finish that I get lingering flavor allusions to roots. I found it interesting that the back label of S. Maria al Monte described its easy application as a grog drink, and on one particularly cold evening I decided to experiment with that a bit. I put 2 ounces of the amaro in a glass with a sugar cube, and poured on top of that various amounts of boiling water. The sugar pretty much dissolves when you add the water, although you can stir the mixture a bit to make that change occur faster. 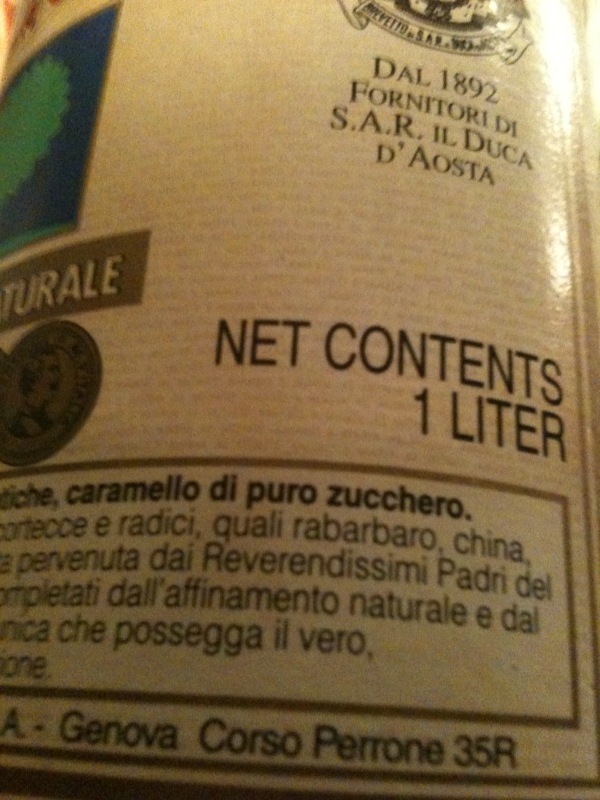 I found that I enjoyed the proportion of 2 parts water to 1 part amaro the most. At that level the amaro flavors were still nicely discernable to me. So thus about 4 ounces of hot water and 2 ounces of amaro seemed to work well in my experiment. One of the things that happens when you add hot water to the amaro is that the alcohol fumes come out more to the nose, which I didn’t really enjoy. To counter that, I tried adding a squeeze of fresh lemon juice, and that seemed to do the trick nicely, lending citrus highlights to both the nose and palate. I would imagine that if you had some sudachi on hand that the juice of that might be a nice choice as well. Perhaps a bit of cinnamon would be welcome. With or without the addition of hot water, I tend to think of S. Maria al Monte as a tonic to the fall and winter months, when its bitter qualities seem most appreciated on the palate. This is not the kind of amaro that I would associate with a light aperitivo, but rather it would seem closer in spirit to a fernet. Whatever it is, I personally enjoy it a great deal. For others it might be a kind of switch. S. Maria al Monte amaro is 40% alcohol by volume. It is imported to the United States by Vias Imports Ltd. of NY, NY. Proof of my love for this Amaro! Great posts on Amari.. Keep 'em coming, and thanks. Very interesting post! The Santa Maria al Monte Amaro is actually produced in Genova, in a small factory in the industrial area. The writing "fornitore di S.A.R. il Duca d'Aosta" means something like "supplier of H.R.H. the Duke of Aosta", so they recall him just as a testimonial. From the point of view of the ingredients, well, they claim to use 36 herbs and radishes from 4 continents (I don't know which continent is not represented, I'd bet on Australia, anyhow): this is compatible with the fact that my city is a harbour since many centuries, so it has always been somehow easy to find things coming from almost everywhere. I'm happy you enjoy it!